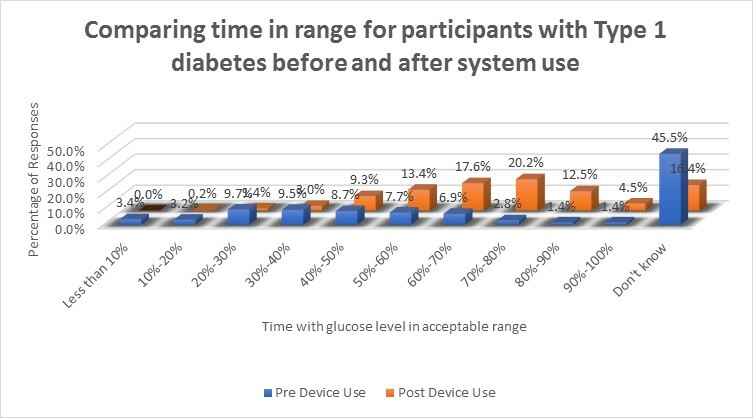 This study analyzed user’s views on their use of real-time continuous glucose recording (CGR) systems in relation to their diabetes. CGR users completed an anonymous online survey relating to their use of CGR. Questions with multiple choice or numerical answers included age, diabetes type, type of CGR used, money spent on CGR, duration of CGR use, Hba1C before and after using CGR, time in range reported before and after CGR, qualitative questions relating to use or otherwise of CGR, relation to fingerprick testing amounts and for those in the UK, local Clinical Commissioning Group. There were also free narrative response fields for those that wished to provide further information. I have used data analysis techniques to analyze 551 responses. The majority of responses showed an improvement in reported metabolic control, with 78.6% reporting an Hba1C below 7.5% after using a system compared to 45.9% beforehand. Changes in Time in Range were also seen by most users, with the majority moving from not knowing to having this information. 75% of participants had used a system for less than two years. 44% of participants were using the Abbott Freestyle Libre system, with 42% using a form of Dexcom system. Only 14% of participants were using Medtronic systems. 60% of the responses came from the UK. 18% of the responses were funded by some form of insurance or healthcare system, with the majority being self-funded. Users spending more annually on systems showed greater average reductions in Hba1C, although there was little difference in time-in-range. Fewer Flash Glucose Monitoring (FGM) users reported a reduction in number and severity of hypoglycaemic events compared to those using Continuous Glucose Monitoring (CGM). From the qualitative responses, positive experiences outweighed negative ones, although there were understandable issues with cost. The key themes identified from the freeform answers were alleviation of over-riding worries; early warning of hypos; better testing; insight and action and improved quality of life. Insight into the interaction between insulin, glucose levels, food and exercise was the most stated of these. Survey participants indicated that use of CGR provided them with clear benefits, in spite of the costs of the systems. On average, there were very clear improvements in metabolic control, demonstrated in both Hba1C changes, improvements in or knowledge of time in range and reductions in frequency and severity of both hypoglycaemic and hyperglycaemic events. They also reported that use of the systems made them less anxious about living with diabetes. Continuous Glucose Recording (CGR) technology is not widely available within healthcare payment systems throughout most of the world. As a result, a significant proportion of people pay for it themselves. Meta-analysis of Randomised Control Trials shows that in a trial setting, metabolic benefits are seen , in reduced Hba1C, and also evidence of reduced occurrences off hypoglycaemic events   . More recent randomised control trials have backed this evidence up  . User satisfaction and Quality of Life have been explored in relation to use of CGR by multiple questionnaire based studies    and also by analysis of user narratives using a qualitative analysis framework  All of these studies have focused exclusively on Type 1 Diabetes, in spite of the use of these technologies by an increasing number of those with Type 2 Diabetes. This survey sought to provide insight into metabolic changes by obtaining feedback from those who use and pay for CGR systems, understand the benefits that they consider they obtain and issues they may have (through both preconceived and free answer questions) and to determine how much they are willing to spend in order to obtain these benefits. An online survey was designed to capture user data (available at https://diabettech.typeform.com/to/TwXH4V and in Appendix B.). The survey was advertised worldwide via various sources, including the diabetes.co.uk forum, the Diabetes UK forum, various Facebook sites linked to the Diabetes Community, the Diabetes Daily forum and also Twitter. I received 551 anonymous responses, which were then reviewed for data integrity. All responses are self-reported outcomes. Questions 1-12 were multiple choice or numerical and provided data that has been used to show variation in metabolic indicators, participant spending on their systems, plus some background as to the people on which the systems are in use, including multiple types of Diabetes and age. Questions 13 and 14 provided both preconceived issues and benefits and additional free text fields that allowed participants to enter their own views. The results and conclusions of the survey range across all the question sets. Numerical answers were reviewed and formatting was normalised to allow exploratory data analysis. Where data provided was uninterpretable, the answers were marked invalid. 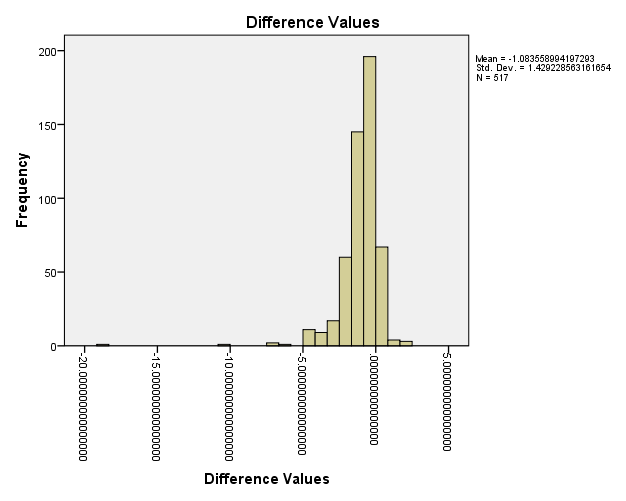 Simple statistical analysis was undertaken on questions with a distribution. For the freefrom answers, a qualitative analysis was undertaken using Thematic Content Analysis  by T.S. Open Coding — the raw data is reviewed and a word or phrase to describe elements of the content noted. Categorisation — the words or phrases from the Open Coding process are reviewed and duplicated items removed. Categories where overlaps occur are combined. Final Coding — Informed by the analytical and theoretical ideas developed during the research, these categories are further refined and reduced in number by grouping them together. 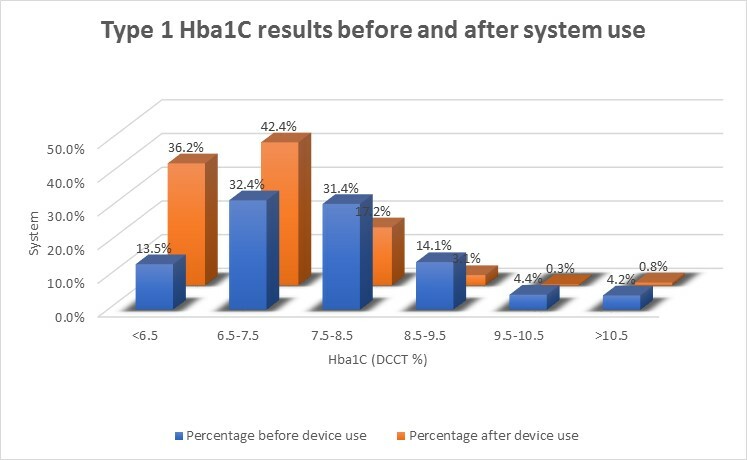 The survey was responded to by people with different types of diabetes, with different Hba1Cs before and after using their systems. Due to the split of the results, high level data is presented across all participants, and a deeper dive is taken into only the type 1 responses. A further paper will detail the type 2 responses. There were 551 responses although not all provided metabolic indicators. The results from those who did are available in table 1. The average reduction in Hba1C across all participants was 1.1% (±1.3%). 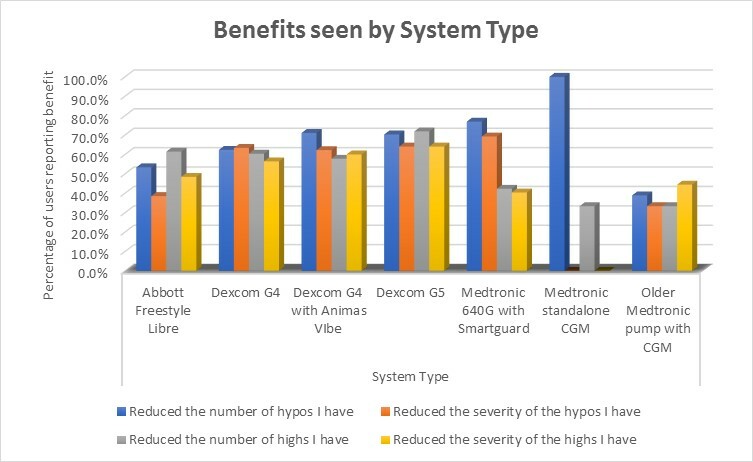 System use of participants was largely the Abbott Freestyle Libre and a combination of various Dexcom systems, as shown in table 2. 75% of participants had used a system for less than two years. 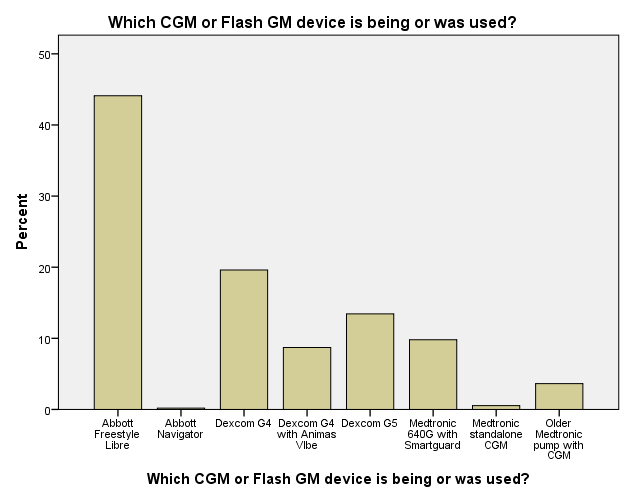 Medtronic CGM was the least popular, and mostly used in conjunction with the 640G using SmartGuard. 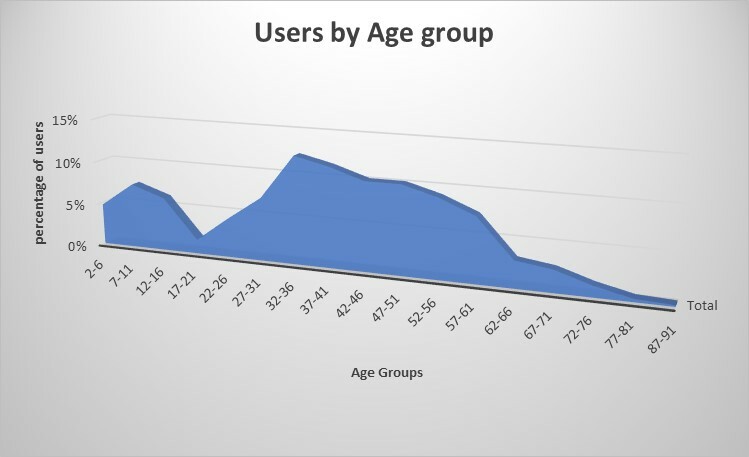 The average age of users of the systems was 37.7 years (±17.9 yrs). 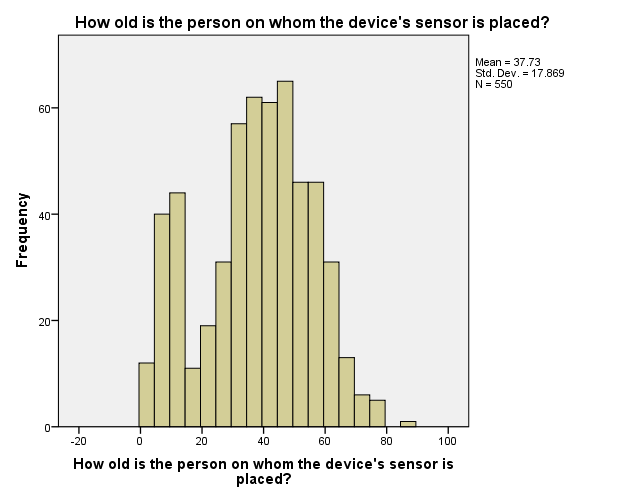 The distribution of age is shown in figure 1. 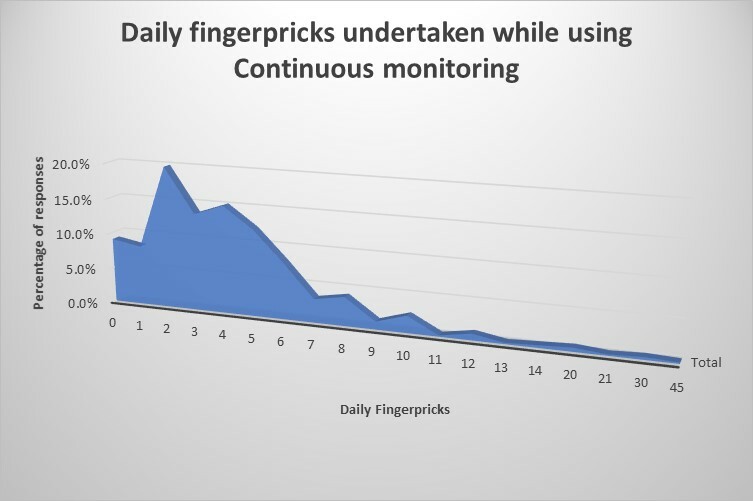 For all users, the number of fingerpricks daily currently being done was reported. The mean was 4.0 (±3.7) times, with the distribution as shown in figure 2. 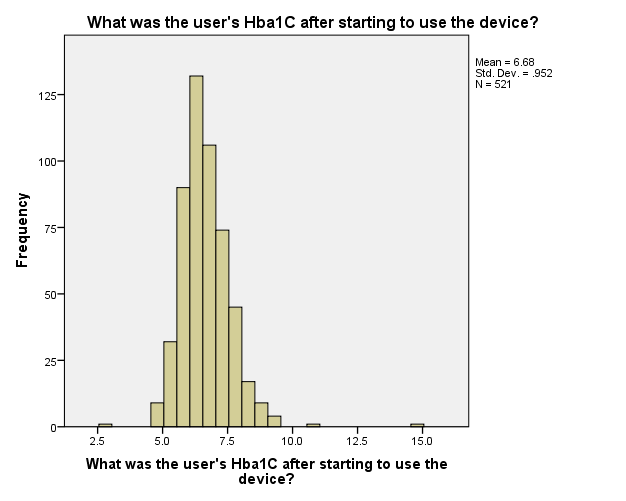 An additional frequency distribution can be found in Appendix A.
Hba1C results, as reported by the participants in the survey showed noticeable change. Hba1C results may be from either clinical or software estimates. 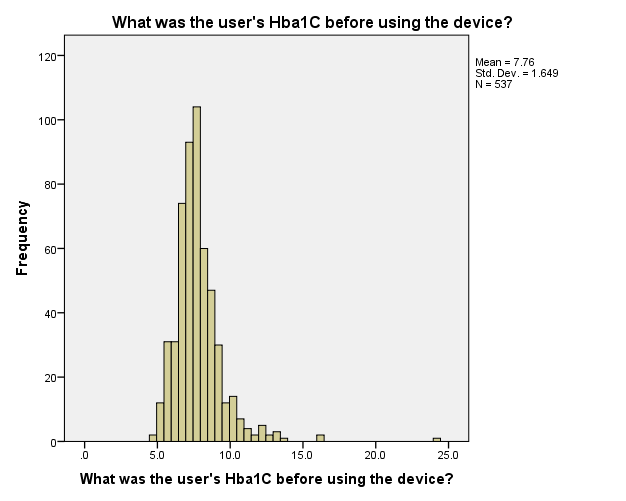 The average Hba1C of those who responded (475) dropped from 7.7% (±1.6) using DCCT units to 6.7% (±0.9), with a clear shift in the distribution of results. Time-in-range was also reported on by participants. For the purposes of the survey, the participants were left to determine their own range. Prior to using their systems, 45.5% of participants with type 1 diabetes didn’t know their time-in-range and only 20.2% were able to report their time in range as greater than 50%. 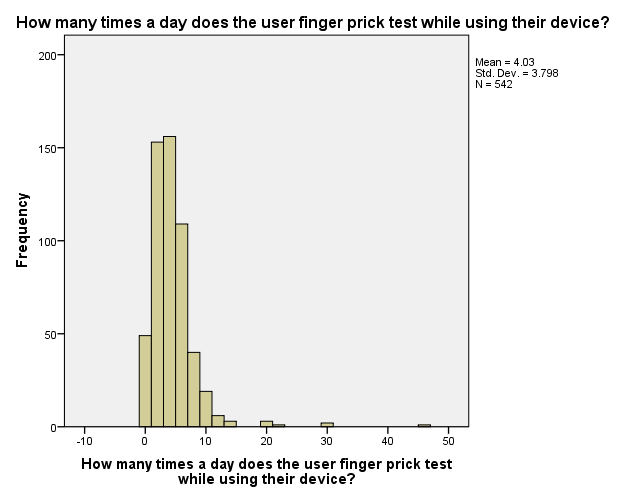 Post use of a device, the proportion that did not know their time in range dropped to 16.4% and 68.2% of the participants reported time in range as greater than 50%. Participants were also asked whether use of a CGR system had impacted their experience of living with diabetes, in terms of frequency and severity of hypo and hyperglycaemic events. 61% of those responding reported that hypo-glycaemic events had reduced, while 59% reported that hyper-glycaemic events had been reduced. 52% equally responded that the severity of the lows and highs they experienced were reduced. 43% equally said that hypo- and hyper-glycaemia count and severity had reduced. 46% felt that the number of both hypo- and hyper-glycaemic events had dropped, with 40% saying they had seen a reduction in the severity of both hypo- and hyperglycaemic events. When compared across different systems, participant feedback showed that a greater proportion of the users that used Continuous Glucose Monitoring systems compared to the Flash Glucose Monitoring system said they benefited from reductions in hypoglycaemic events, although the reduction in hyperglycaemic events was reported to be similar. The largest reduction in number and severity of hypoglycaemic events was reported by those using the Medtronic SmartGuard systems. Due to the small number of responses from users with the standalone Medtronic CGM, the results for that device overplay the impact. Spend on continuous recording systems is dependent on the type of system used. 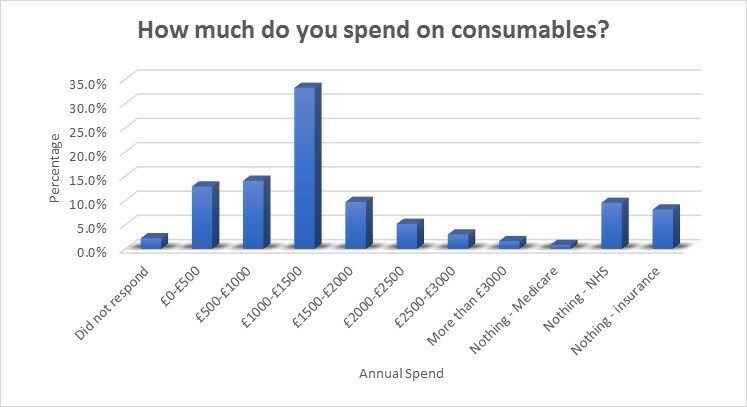 Overall the distribution of spend on systems showed that the majority of T1 participants spent £1000 to £1500 annually on the consumables required to use their choice of system. Users of the Medtronic systems had the largest percentage of health system coverage within their system type, with while those under-16 had the largest percentage of all costs covered by a healthcare provider, at 37%. This is largely influenced by the amount spent on Libre and Dexcom G4 consumables. The Libre system showed a lower annual spend than most of the other systems. Medtronic standalone CGM data was removed from the chart for clarity purposes, although it reflected the wider trend in Medtronic CGM use of having a higher proportion of healthcare provider paid users. When a two-sample t-test assuming unequal variances was undertaken with a null hypothesis that those spending £0-£1000 annually on their system have an average change in Hba1C that is similar to those spending more than £1000 annually, the null hypothesis was rejected with P<0.05. With a two-sample t-test assuming unequal variances undertaken with a null hypothesis that those receiving NHS funding have an average change in Hba1C similar to those spending more than £1000 annually, the null hypothesis was accepted, although P=0.090. When a similar t-test to the first was run for those using Libre alone, the results were that spend appears to influence average change in Hba1C level (P=0.005). In addition to the metabolic benefits stated earlier, participants also reported that that additional benefits came in the form of peace of mind in relation to looking after either themselves or someone else in their family, and also gave peace of mind to their families and friends. When taken together, the percentage finding peace of mind in relation to themselves or somebody else in the family with diabetes accounted for 82.6% of the responses. I identified five themes from the 65 freeform responses provided by participants. These were alleviation of over-riding worries; early warning of hypos; better testing; insight and action and improved quality of life. These were listed in addition to the previously mentioned benefits. Of those responding in free text, the majority of benefits came from the ability to observe patterns and react to them as a result of the data. This was identified by 56% of participants that responded to this section of the survey. Although 15% of the participants stated that they were either no longer using a system or only used a system sometimes, 26% responded to the question about inhibitors to use. By far the largest response (71% of responses) was that the systems cost too much. When broken out by whether a system was still in use, cost was stated to be the biggest issue that participants raised. Amongst those who are still using a system, issues with volume of data, alarm fatigue, sensor inaccuracy, not liking wearing a sensor and adhesive reactions were stated. Of those that had stopped using the systems, cost was cited as the most frequent reason for stopping, but system inaccuracy and a bad reaction to the adhesive were also raised. Other reasons given for variability of usage were issues with supply, by two participants and choice of using only for diagnosis of issues, rather than full time. When comparing the Hba1C change between those who were still using the system, those who sometimes used it and those who no longer did, there was a difference in the reduction noticed, as shown in table 4. The data presented in this report was taken from a survey allowing users to self-report all the aspects covered. It is clear that those who participated do not follow the typical profile of UK people with diabetes, as demonstrated by table 5, which compares the distribution of Hba1C measures versus the UK National Diabetes Audit. The survey participants, prior to any use of continuous recording systems had nearly twice as many people with an Hba1C below 7.5% as the 2015-2016 National Diabetes Audit. The responses do not therefore reflect the average person with diabetes, and it is likely that this is a linked to the participants receiving notification of the survey through various social media. The reductions in Hba1C and Hypoglycaemia that were reported by the participants were consistent with recent RCTs [1, 2, 6, 5]. The reported improvements in time in range and reduction in hyperglycaemia were also consistent with the reduction in Hba1C. Whether the system was paid for out-of-pocket or by a healthcare provider or insurer had no impact on the average change in Hba1C of participants. 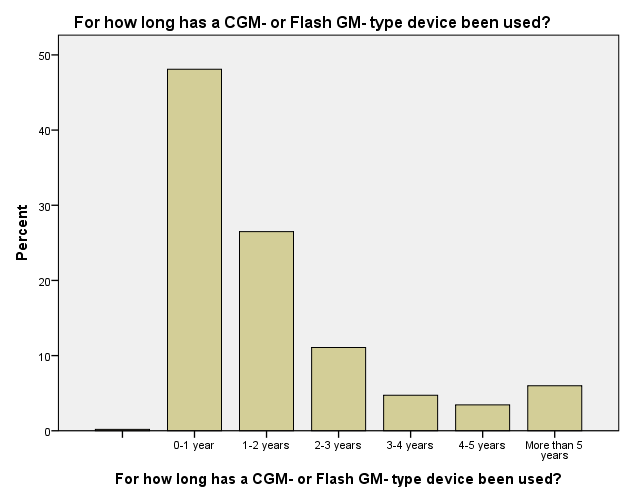 While the majority of participants reported a reduction in frequency and severity of hypoglycaemic and hyperglycaemic events, when this was broken out by system type, the proportion of participants reporting reductions in frequency and severity of hypoglycaemic events when using flash glucose monitoring (FGM) was lower than those using continuous glucose monitoring (CGM). 53% of FGM users reported a reduction in hypoglycaemic events versus more than 62% on all other systems except older Medtronic pumps. Likewise, 39% of FGM users reported a reduction in the severity of hypoglycaemic events, versus more than 60% on all other systems except older Medtronic pumps. Based on this, I hypothesise that while the benefit provided by FGM in terms of visibility of the vector of glucose levels provides benefit, it is likely that the ability to be alerted about a dropping glucose level is of more benefit in taking action to avoid the outcome. In light of the above, what was notable was the percentage of FGM users reporting reduced frequency and severity of hyperglycaemia was in line with those using CGM, and that fewer of those using the Medtronic 640G with SmartGuard reported a reduction in frequency and severity of hyperglycaemia. 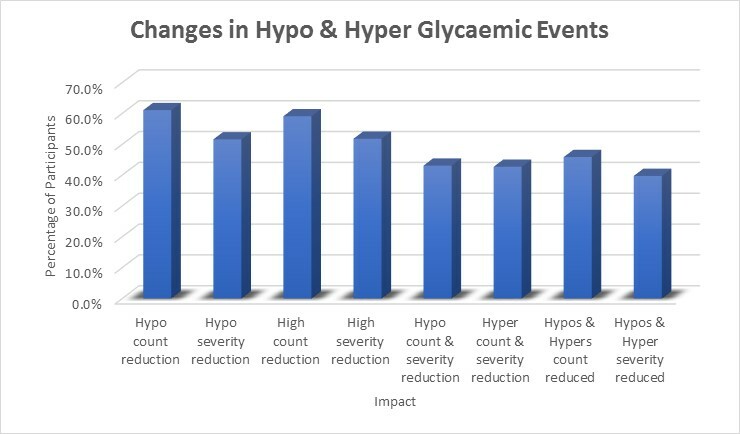 This may be due to those using this system having issues with hypoglycaemia awareness and as a result managing things differently, however the average reduction in Hba1C by system was reasonably consistent. Most participants stated they are spending between £0 and £1500 annually on the consumables for their system of choice. This is not entirely reflective of off the shelf costs of the various systems, as there are many users of the Dexcom range of systems that use the sensors “off label” and get considerably more than the manufacturer stated seven days use. 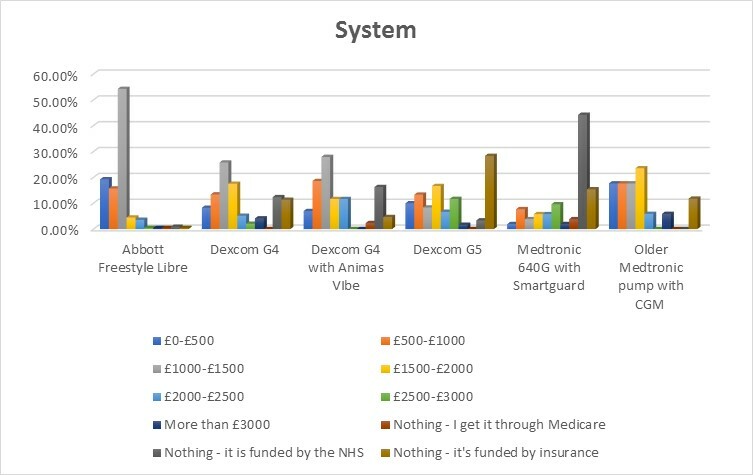 What the data also appears to show is that while many users of the Abbott Libre system stated they were still using it, they are not necessarily using it full time, due to the expenditure on the consumables. Running hypothesis tests using spend on consumables and average change in Hba1C, a two-sample t test assuming unequal variances showed that the reported average reduction in Hba1C of those spending more than £1000 per annum on consumables was greater than that of those spending less than £1000 per annum, and the difference was statistically significant. I suspect that annual spend on consumables is likely to be the best proxy to determine whether a user is using their system “full time”. The rejection of the null hypothesis, that those spending less than £1000 per annum have the same average change in Hba1C to those spending more than £1000 per annum, suggests that those using their systems full time achieve greater average reductions in reported Hba1C, which reflects other studies on the use of CGM [5, 6]. Using the clear cost differential for Libre as a way of indicating if a system was being used full time (spending less than £1,000 per month does not align with the cost and deterministic nature of the lifespan of Libre consumables), when the same t-test was run on Libre results alone, there was significant rejection of the null hypothesis, with P=0.005. Whilst this strongly suggests that part-time use of a glucose recording system does not yield as good results as the full-time use, as previously mentioned, it also doesn’t take into account whether this was the intended aim of the participant, and further research would be needed to establish this. When comparing the variation of time in range identified by these two groups, the variation is much smaller. As time in range can only be effectively measured when using the CGR system, the results are also biased towards those periods when they are in use. Further research into the effects of using CGR part time or full time on glucose variation is needed. A similar hypothesis test, looking at whether those with NHS funded systems had a lower average reduction in Hba1C than those who paid more than £1000 per annum rejected the null hypothesis, and showed average reductions were quite similar, although P<0.1. This potentially gives an unfair view of the performance of NHS funded systems, as a key reason for NHS funding relates to impaired awareness of hypoglycaemia, and the expected outcome of use in this context is more likely to be an increase in or stability of average Hba1C levels. Whilst the metabolic benefits were clear for participants, psychological benefits were also reported, with 61.7% of participants stating that they worried less about their diabetes and 20.9% reporting that they had peace of mind over someone else in the family as a result of using the system. This and the benefits of being able to identify patterns and act on them, that 56% of the freeform answers stated, reflects what other studies have found in relation to well-being and continuous monitoring [7, 8, 10]. 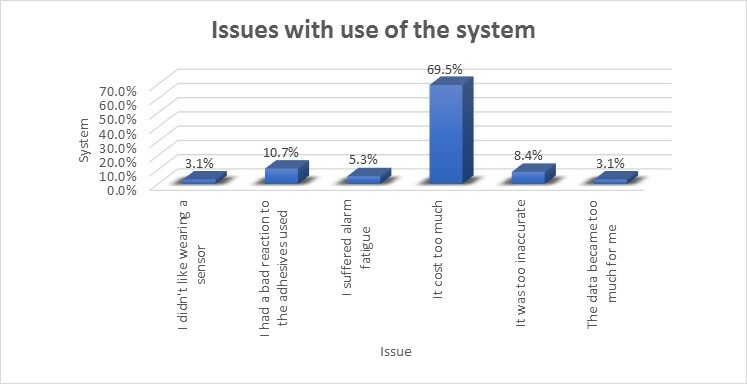 Reflecting that the survey was generally completed by people that currently use these systems, 26% of participants reported issues with the systems and amongst those still using them 14% felt that the cost of consumables was too high. Further research on the demographics of participants would provide useful insight into whether they are sacrificing in order to obtain these technologies, and if so, how much, giving a view of the real value to individuals. This study has some limitations. As a self-reported set of data, accuracy of factors such as Hba1C and hypoglycaemic events cannot be confirmed. Likewise, the responders were left to provide their own determination of the range for time in range rather than any range being specified, so there are no objective measures for reported benefits. Participants were engaged through a number of social media mechanisms, some of which included notable bias towards the use of continuous recording systems. As this was intended as a survey to show how those who used systems benefited from them, this is understandable, however it may also have provided a more positive bias in the results than a wider data collection exercise. I also acknowledge that my use of technology and living with type 1 diabetes may influence my analysis of the data, however the data is available for anyone who wishes to use it to review, as it is anonymous. In conclusion, the participants of the survey reported metabolic and psychological benefits of the systems they use. In spite of spending thousands of pounds on them, to those who continue to use them at the current cost, they provide a benefit that makes it worthwhile. J. C. Pickup, S. C. Freeman and A. J. Sutton, “Glycaemic control in type 1 diabetes during real time continuous glucose monitoring compared with self monitoring of blood glucose: meta-analysis of randomised controlled trials using individual patient data,” BMJ 2011;343:d3805, 2011. T. Battelino, M. Philip, N. Bratina, R. Nimri, P. Oskarsson and J. Bollinder, “Effect of continuous glucose monitoring on hypoglycemia in type 1 diabetes.,” Diabetes Care, vol. 34, pp. 795-800, 2011. P. Choudhary, S. Ramasamy, L. Green and et al., “Real-time continuous glucose monitoring significantly reduces severe hypoglycemia in hypoglycemia-unaware patients with type 1 diabetes.,” Diabetes Care, vol. 36, p. 4160–4162, 2013. T. Ly, J. Nicholas, A. Retterath, E. Lim, E. Davis and T. Jones, “Effect of sensor-augmented insulin pump therapy and automated insulin suspension vs standard insulin pump therapy on hypoglycemia in patients with type 1 diabetes: a randomized clinical trial.,” JAMA, vol. 310, pp. 1240-1247, 2013. M. Lind, W. Polonsky, I. B. Hirsch and et al, “Continuous Glucose Monitoring vs Conventional Therapy for Glycemic Control in Adults With Type 1 Diabetes Treated With Multiple Daily Insulin Injections,” JAMA, vol. 317(4), no. doi:10.1001/jama.2016.19976, pp. 379-387, 2017. R. Beck, T. Riddlesworth, K. Ruedy, A. Ahmann, R. Bergenstal, S. Hallar, C. Kollman, D. Kruger, J. McGill, W. Polonsky, E. Toschi, H. Wolpert, D. Price and for the Diamond Study Group, “Effect of Continuous Glucose Monitoring on Glycemic Control in Adults With Type 1 Diabetes Using Insulin InjectionsThe DIAMOND Randomized Clinical Trial.,” JAMA, vol. 317(4), no. doi:10.1001/jama.2016.19975, pp. 371-378, 2017. W. Polonsky and D. Hessler, “What are the quality of life-related benefits and losses associated with real-time continuous glucose monitoring? A survey of current users.,” Diabetes Technol Ther., vol. 15(4), no. 10.1089/dia.2012.0298., pp. 295-301, 2013. K. C. Barnard, T. Kubiak, C. G. Mann and L. Heinemann, “Psychosocial Aspects of Continuous Glucose Monitoring,” Journal of Diabetes Science and Technology, vol. 10, no. 4, pp. 859 – 863, 2016. J. James, M. Chamberlain, D. Dopita, E. Gilgen and A. Neuman, “Impact of Frequent and Persistent Use of Continuous Glucose Monitoring (CGM) on Hypoglycemia Fear, Frequency of Emergency Medical Treatment, and SMBG Frequency After One Year,” Journal of Diabetes Science and Technology, vol. 10, no. 2, pp. 383 – 388, 2016. J. C. Pickup, M. Ford Holloway and K. Samsi, “Real-Time Continuous Glucose Monitoring in Type 1 Diabetes: A Qualitative Framework Analysis of Patient Narratives,” Diabetes Care, vol. 38 (4), no. DOI: 10.2337/dc14-1855, pp. 544-550, April 2015. P. Burnard, P. Gill, K. Stewart, E. Treasure and B. Chadwick, “Analysing and presenting qualitative data,” British Dental Journal, vol. 204, pp. 429-432, 2008. If you’d like to get in touch regarding the content of this page, please use the below contact form.